The Raysor plots are in the Greenwood Section of Highland Memorial Park/Woodlawn Cemetery in the 1400 block of NE 3rd St. in Ocala. 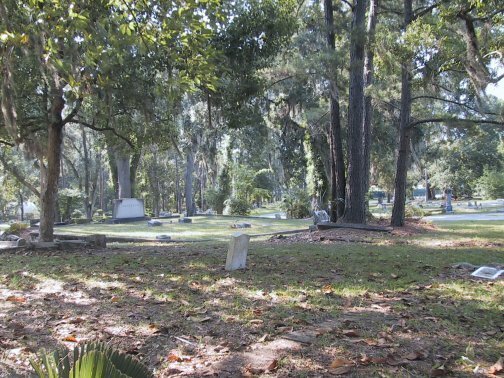 There are no signs designating the different sections of the cemetery or identifying it as Greenwood. They are in the Southwest corner about 250 yards in from the South and 100 from the West boundary. (my guesstimates) Two low brick enclosed plots, each 20x20 feet. Others known to be buried there are Henry (Chalmers) Raysor, his mother, Ella Brown Raysor and an unknown sister. There are likely others. That burial information came from Chalmers Raysor's obituary. Read Beverly's story of her adventure, May 10, 2003, below. The mystery was a full day but has been solved! 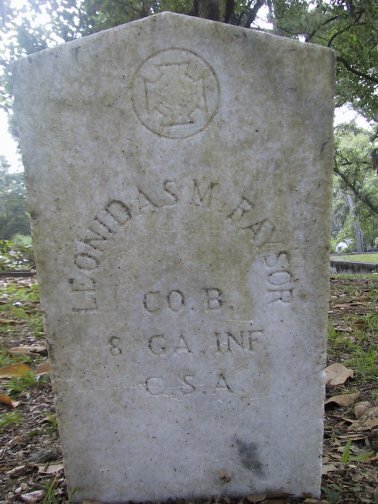 I found the grave of Leonidas M. Raysor b. 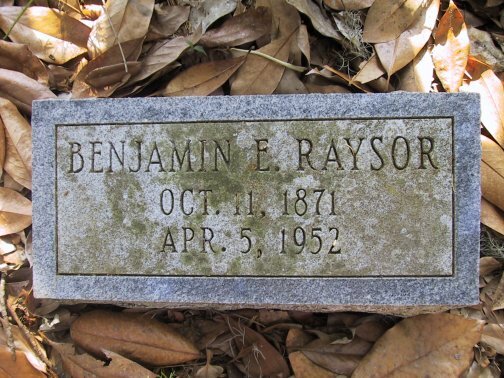 1830 SC, his son Lee M. Raysor b., another son Ben Raysor, and a grandson, James E. Raysor. 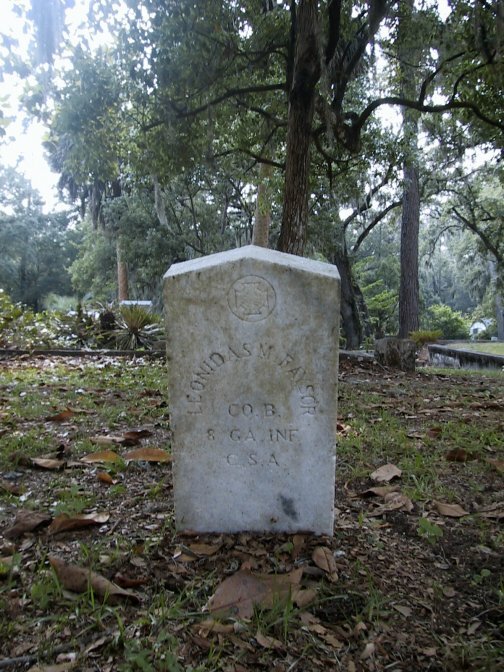 Henry (Chalmers) Raysor's obituary stated that interment was to be in Greenwood Cemetery in Ocala next to his mother and sister. I had hoped to find Leonidas M. with them. I found the cemetery and I stumped it from one end of the other but not a single Raysor to be found! I was heartbroken but not ready to give up. I headed to the library, which thankfully was open on Saturday, but there wasn't any information in the archives room, the librarians didn't' have a clue how to help and I wasn't getting anywhere rummaging through their limited holdings. Then someone finally found a woman named Sharon who was a lifesaver. There isn't a complete transcription book of graves in Marion County, but the genealogical society has compiled a few. Sharon had a locked room of loose papers behind the archives room and she started digging and came up with five typed sheets of burials in Greenwood Cemetery. Leonidas M. Raysor was in it! But no other family members were listed. The transcription was done in the mid 1960's so we were wondering if perhaps the stone had been destroyed in the interim. 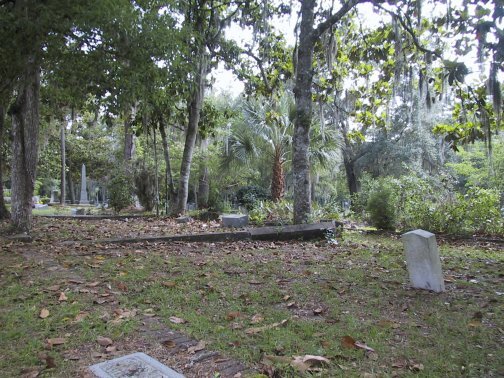 We started discussing the trip up from Bradenton, and I mentioned how I found the cemetery and she said "Oh my goodness! Are you sure you are looking in the right Greenwood Cemetery?!" I said "There's more than ONE?" She said well, sort of. The old Greenwood Cemetery is now part of Woodlawn, a HUGE cemetery so it might not show on GNIS. Ah! She said "you'll never find it in there, there are thousands of graves. But Hiers Funeral Home might be able to help. The records are held by the county engineers, but I think he talked them into giving him a copy." 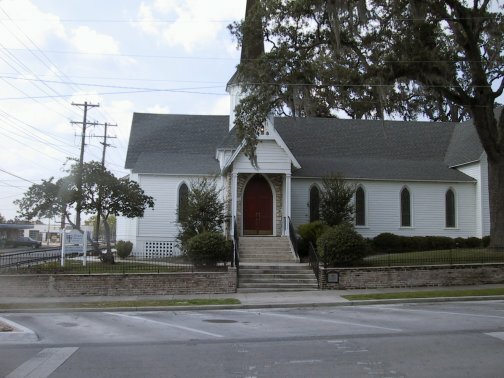 She furnished me with his number and sent me on my way with good wishes and directions to Grace Episcopal Church (the church of Chalmers Raysor's funeral). I stopped by and took a few pictures of the pretty old church and called Hiers Funeral Home. Another good Samaritan! He met me at the cemetery office and drove me straight to the gravesites. And in addition told me I would find two more Raysors buried near Leonidas. The Raysor family had purchased two 20x20 plots, enough room to bury 16 people in a section called Greenwood. He told me also a great number of records were lost in a fire in the early 1900's, so it was possible there were others buried there but not on the plats. 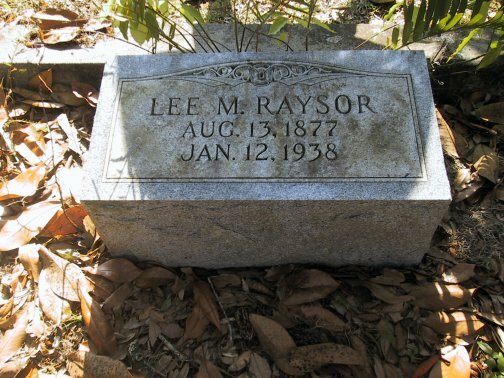 also surrounded by low brick and there were two headstones in the far left corner, one of Ben Raysor and the other of Lee M. Raysor, both sons of Leonidas. It was a rewarding end to a long day!